Hey guys! I figured I would do both a video and written tutorial for you guys this week so that if you are better with watching or reading you can do it! I did this one without any extensions (and my hair is wet… I don’t have the patience to blow dry it all the way sometimes!) so I know that it will still look cute with any length or thickness! Hope you guys enjoy! 1. Part hair in the middle. 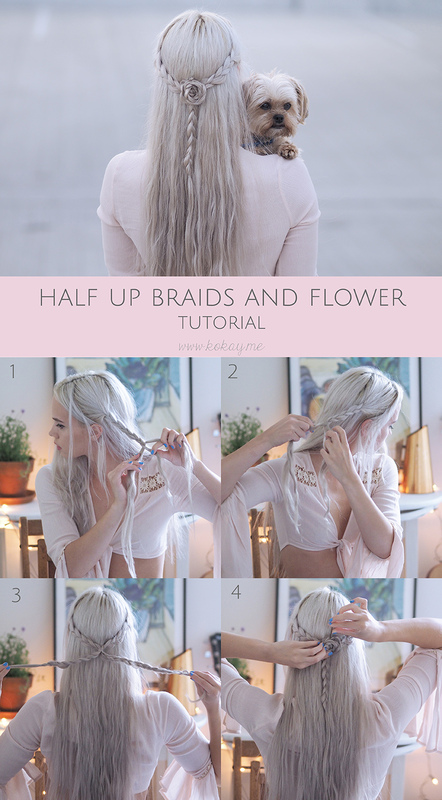 Take a section from one side of your head and do a three strand braid toward the back of your head. Pull it apart and secure with an elastic. 3. Join these together with a clear elastic in the middle of the back of your head. 4. Twist whichever braid is longest into a flat flower and weave bobby pins in to secure your flower! It might be easier to watch so here is the video! !